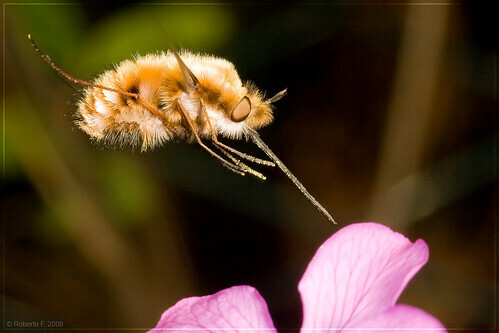 It is a "Bombylius major". Many thanks to Laura from www.bumblebee.org that always helps me with her experience! These insects are very fast but they often stay in suspended flight for a couple of seconds before they pose to a flower. In one of these moments I took the photo. Questi insetti si muovono molto velocemente ma spesso rimangono in volo sospeso per un paio di secondi prima di posarsi su un fiore. Ho scattato la fotografia in uno di questi attimi.